Why buy a walk in senior bathtub that doesn’t have a low step in? Not all walk in baths are going to have the same step in height. Besides for the construction of the tub, sometimes the height can be determined by existing plumbing or construction of the wet area. This can entail situations like slab on grade and other variables that can affect height. A good height for many is 7” which is about the same height as a standard step. We offer tubs with 3.5” step in height up to about 9”. It will vary depending on the model of step in tub selected. 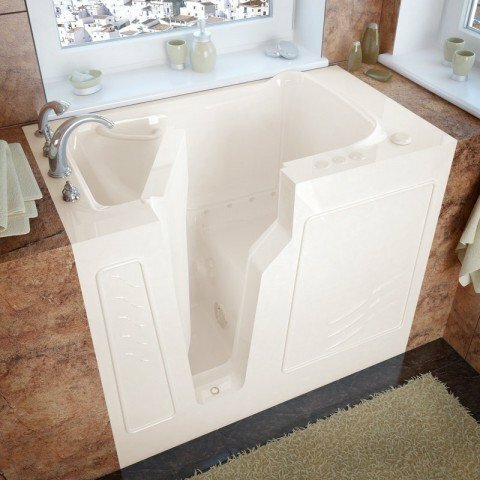 Almost all of Aging Safely’s handicap bathtubs can be customized according to your needs and desires. You can add or take away options as you see fit. Some bathers enjoy soaking and prefer to have a system that has whirlpool jets and air hydrotherapy, whereas others may prefer to simply soak in a non-jetted walk in tub. We offer many options for you to choose from and understand seniors aren’t all alike, and therefore all senior bathtubs shouldn’t be the same either. Get one that matches your lifestyle and décor. Senior tubs are a great choice for aging in place and fall prevention plans. They can help people stay independent longer and be able to bathe again. 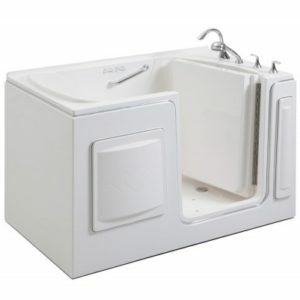 Our senior bath tubs can be installed into almost all styles and types of homes. They can also work well for assisted living facilities and senior living centers. We offer several traditional step in style walk in tub products, but also carry a line of fully handicapped wheelchair accessible transfer bathtubs. Contact an Aging Safely Senior Bath Representative today for a free no obligation consultation. Find then walk in tub, handicap shower or wheelchair accessible transfer bath that is just right for you.